FRIDAY, FEBRUARY 19, 2016 (6pm ET/3pm PT). It’s a look at songs that sound the same… just too the same. Author and musicologist Tim English discusses the phenomenon of “borrowing” music from other artists. Then, Tony nominee Orfeh shares her personal struggle with someone lifting her music without permission. Kroll Call is hosted by Dan J Kroll. Tim English is a recognized authority on the topic of musical plagiarism in pop music. He has appeared on hundreds of radio programs in the U.S., the U.K., and Canada. He is the winner of Independent Publisher’s“Bronze Medal” for one of the best books of the year. He is also the author of Popology: The Music of the Era in the Lives of Four Icons of the 1960s, which examines the role of music in the lives of John and Robert Kennedy, Martin Luther King Jr., and Thomas Merton. Tim will also bring along some songs to see if you can tell which ones have been “borrowed” from the other. Then, Tony-nominated actress and former pop star Orfeh returns to the show to share her own story about having one of her songs “borrowed” without her permission. She’ll share the enraging story of how the person who lifted the song walked away scot-free. Plus, Billy Mitchell returns with the latest on the hilarious stage show “Villain DeBlanks.” And there is sure to be some sort of on-air gigglefest. 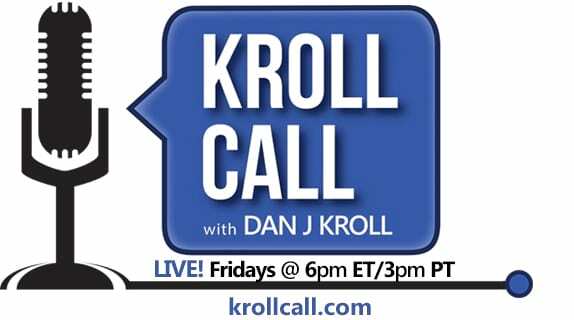 Kroll Call airs every Friday at 6pm Eastern/3pm Pacific, and anytime on demand at krollcall.com. Free podcast downloads are available on iTunes and the Voice America Talk Radio Network. Kroll Call is hosted by Internet pioneer and personality Dan J Kroll, who developed the most widely read soap opera web site, soapcentral.com — a site that has been going strong since 1995.